Participant panel: For more details, continue reading about the central participants database here. To enable this login method, the line $use_one_time_passwords = false; has to be set 'true' in config.php (it is 'false' by default). The passed plain text password will be hashed using the sha256 function and will then be compared to the stored hash in column one_time_pw of table users. Both passwords have to match. 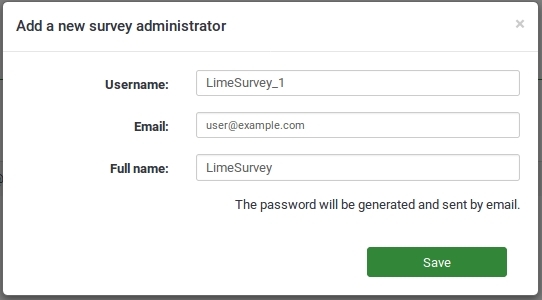 To change the survey permissions, you have to select the Settings menu of your survey, which includes the general settings of your installation. Then, click on Survey permissions and choose to whom would you like to offer permissions. The rights can be offered either separately to specific users or to a user group. Log in as admin (or as a user that has the Superadministratpr permission).